Due to its spectacular location, our home normally rents for $155/night. We have reduced our rates until the economy turns around to allow everyone the opportunity to visit the Big Island without breaking the bank. Our completely remodeled end-unit oceanfront home is located on the ground floor in the Kona Isle condominium complex on Alii Drive within feet of the ocean. The grounds are tropically beautiful, with pool, BBQ area, and white sandy man-made beach area where you can laze the day away. Close to shopping, golf, snorkeling, and restaurants! Alternative Lifestyle families welcome. Whether you chose our home for your vacation or not, contact us and we will be happy to send you a wonderful travelogue on what to see and do while on the Big Island, terrific restaurants, and a guide for packing. *** UNIT IS NOW AVAILABLE FOR RENT FOR FIVE (5) NIGHTS AND LONGER . Please refer to customer testimonial link to read about our guests experiences. Mahalo. We chose Kona for our second home because of the Aloha we've experienced on the Big Island for nearly 30 years. As of October 8, 2016, we now have a Walk-in Shower. No, however, we have ceiling fans and floor fans provided for your comfort. Plantation windows allow breezes off the ocean in our ground floor unit. We now have WiFi Wireless Internet for our guests with dedicated private username and password. So, bring your laptop and connect to the Internet free of charge. What a great location, minutes to Kona and water front out of the ground floor lani. Loved waking up to the sound of waves and sitting enjoying the morning coffee on the lani. Beautiful grounds, loads of extras to use. Thank you Brad and Beth for letting us enjoy you place. We had a wonderful stay at your condo on the ocean on the Big Island. Appreciated having a full kitchen, bedroom, suggestions of activities, and help when I lost e-mail communication. We regret not having more time there! We enjoyed our trips to South Point, the most southern spot in the USA, Hawaii Volcanoes National Park, Hilo, and the Hilton Resort with the monorail and boat rides around the resort! Thanks, Beth and Brad! "We don't want to leave, ever, but reality awaits us. Can't wait to come back. In fact, if we can tack on a few more days next year we will". 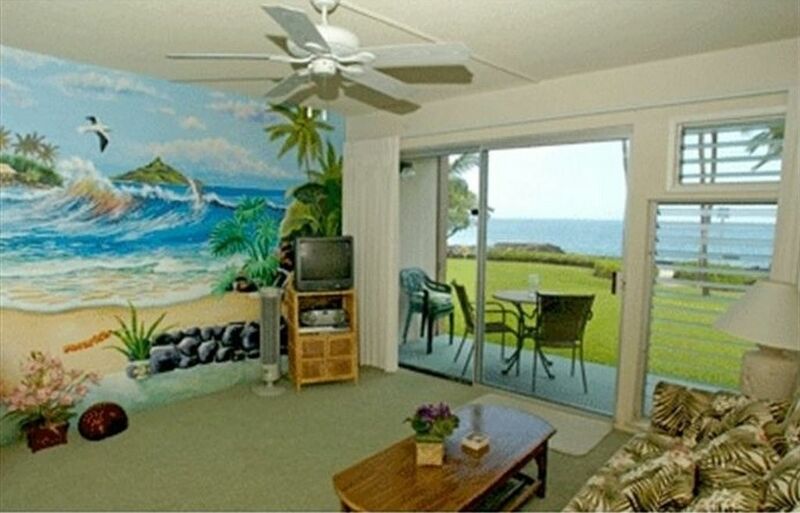 This is a wonderful condo, so close to the ocean you can hear the waves crashing. Beautiful ocean view & sunsets from the lanai and only 2 miles from the heart of Kona. We had a great time here & I highly recommend this condo. We had a wonderful time. The condo was perfect for our needs. The owners checked in on us to assure we were haven't a great stay. Loved having the bottom floor. Best view on the island!!!!!! Our recent stay at Kona Isle was everything we expected and more. The photos were very accurate and the location was perfect. We truly were steps away from the pool and the ground floor lanai was where we spent most of our time. The owner were very helpful and informative and made sure the condo was in perfect shape. The grounds were exceptionally maintained daily. I truly would recommend this unit to our family and friends and would certainly stay here again!!!! Additional charges: $10 per person per night for third and/or fourth person occupying unit.